When is the next MOC going to be? I need more MOC's to be on this site please! Why are the first three comments about when the next MOC is going to be? I made a MOC that looks a bit like Zeyek. He is black, he has a cape, that sort of stuff. I used Atakus's mask with a green head. He has a Skrall sword. That is the only weapon he has. I have left him built for ages and I want to destroy him to make a MOC, but I just can't! I made an acrostic poem about you! Oh but theres a guy in town who is the best! Jang is the best MOCer in the world! A MOC needs something great, and he knows what! No one is as good as LEGOJANG! Geez this poem is over! Oh yeah on the second last line, I didnt really mean that, I mean there are alot of MOCers out there who are awesome! Sorry about the comment. It has noting to do with the post. I made a mini Fangz! No seriosly, I did. I will upload it to the Hero Factory gallery, sometime this month. It will be called Young Fangz, it will be made by "yomayos6". He will be 10 years old and lives in Australia! (Me). This is probably the longest comment I have ever posted on your blog! I was thinking of modifying a Reeka design to accommodate six legs and a Barraki head... I have a rough design so far, and I've made a preliminary version. In response to the first few comments, they will be posted when JANG wants to post them. Simple as that. Hey, JANG, I know it is a lil' bit too late to use THOSE pieces, but I think you can make a new kind of defense drone of Hero Factory or something like that, using Nitroblast scheme (changing some things to do it interesting), but using Jetbug's pieces (like the mask, obviously xD). Then, make a silver Fire Lord one, not as bigger as the original (but not make a chibi version like with WD :P), with DrillDozer face turned around, and with DD's drill, and use him as the leader of those defense drones ("using Fire Villains technology for very difficult missions", you might say), and use them to fight Witch Doctor drones. @chronos,lordoftime the third comment was posted by me! just wanted to point that out. I built 3 Reeka today! @Anonymous (7th comment)- I know, it was an indirect reply. @XTN- cool, I made two but I disliked their color schemes, so I'm trying to get a few pieces from my bro. Hey Chronos, what do you think about my idea of the drones (6th comment)? Pretty good idea... the Heroes are needed elsewhere, so they send in the drones. Maybe with fire villain parts... It would be interesting... Did you already MOC these, or are they just ideas? 2.0 sets not available yet? Dang. Are you the same person who said that your English was not very good? It's actually very good. Great. I would have had all the 2.0 sets by NOW, because I already had Stormer 2.0, Drilldozer, Nitroblast, Jetbug and Surge 2.0. Before my birthday, It was my brothers birthday. He got Stormer 2.0 for his birthday from a friend. I was going to get Fire Lord for his B day, but I ended up getting a transformer. Then I was allowed to go get something from the shops and I got Nex 2.0. And guess what, my brother got a transformer! Then I went to the shops again and got Breez 2.0, and my brother got a Tech Deck. I'm not happy. So the conclusion: Sets that are mine in Ordeal of Fire: Surge 2.0, Nitroblast, Drilldozer, Jetbug, Nex 2.0, Breez 2.0. Sets my brother has got in Ordeal of Fire: Stormer 2.0. Sets we have not got in Ordeal of Fire: Furno 2.0, Evo 2.0, Fire Lord. Now I can just tell my brother does not like the 2.0 heroes and the fire villians. Well, in Spain they almost didn't release the Ordeal of Fire, except Fire Lord, Nitroblast and Furno 2.0. 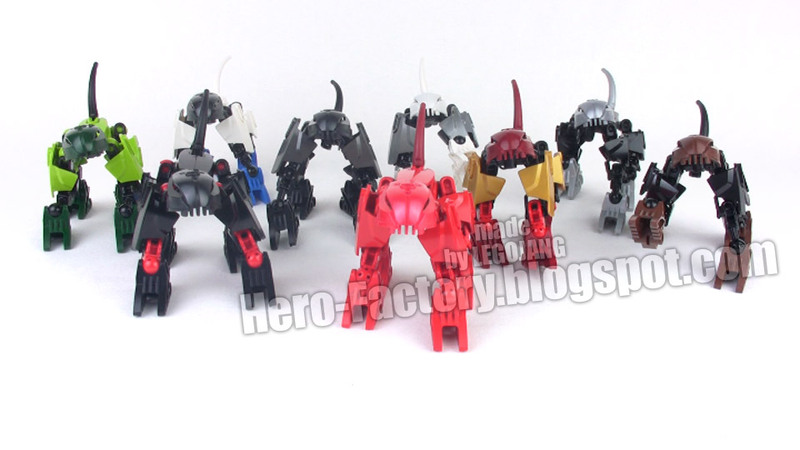 The Savage Planet series has been fully released, and I'll buy some of them, as Rocka, Furno 3.0 and Raw-Jaw because I want to make a red elephant-like creature!